Have you ever seen a painting or maybe a room in someone’s home and thought ‘That would make a great outfit?’ No? Maybe? I’ve taken cues from home design color schemes before when it comes to putting together an outfit. For example, grey and yellow seems to be a popular design mix at the moment when it comes to master bedrooms. But those colors also make one gorgeous outfit. When ShoeDazzle Senior Design Director Alejandro Blanco saw Los Angeles-based Jennifer Rae Och’s “Verdant” painting, he thought ‘wouldn’t that make a beautiful dress?‘ He was spot on. It did indeed make one beautiful dress. 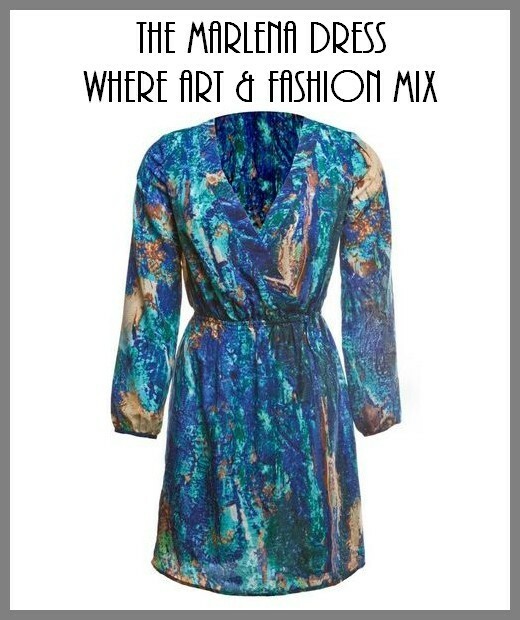 The Marlena Dress from Madison by ShoeDazzle is made from fabric inspired by Och’s “Verdant” painting, a two-panel piece of acrylic paint and highly texturized mixed media on canvas. This dress is part of their Madison Collection, which is described as a collection of ‘modern chic looks’. It retails…wait for it…for only $49.95 (but at the time of this writing, it’s on sale for $39.96!). For ideas on how to dress down or accessorize The Marlena Dress, go here. So the next time you see a beautiful room or a beautiful painting, see how you could incorporate those color schemes into your own wardrobe. Style should be fun. Getting dressed every morning should be really fun!